With industry leading features, Jacobsen’s new ZT series delivers dependable performance and professional results. The ZT600 is available with up to a 23.5-hp. Kawasaki FX or a 25-hp Kohler® Confidant EFI engine, 48-, 54- and 60-in. width of cut options, and a ground speed of up to 10.5 mph. The ZT600 utilizes Parker transmissions for the smoothest drive and 1,000 hour oil change intervals. With operator comfort in mind, the ZT600 comes standard with a suspension set for added comfort for extended mowing durations. 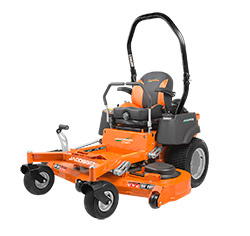 See your local Jacobsen dealer to test-drive.